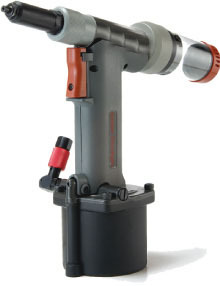 The great power of a reliable riveting tool, lightweight and compact. ProSet® The 1600 model offers a fitting innovative angled air, which moved to the left or right and provides with an ON / OFF function, increasing flexibility, conserving energy and reducing production costs. The ProSet® 1600 laying rivets 2.0mm Micro Rivets, 2.4mm and 3.2mm up to 4.0mm all matters and at all open steel rivets.